Although these first three images portray bedrooms, these stencil applications are suitable for any room. Notice the stencil placement in relation to the wood trim. 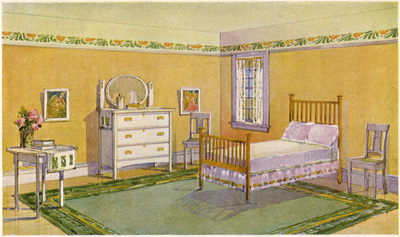 Yellow Room: Stencil image appears above or below a picture rail, very typical in a bedroom where often crown molding is absent. 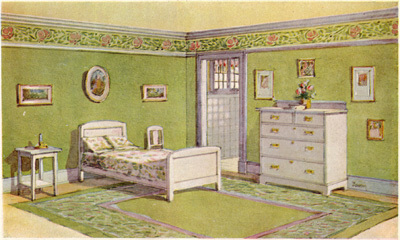 Green Room: Stencil image fills frieze area between crown molding and picture rail. 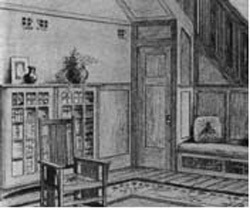 Design should be between 3-5 inches narrower than the height of the frieze. 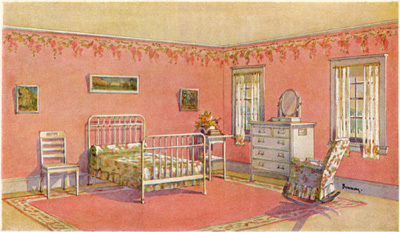 Pink Room: Stencil image runs at top of wall, with or without crown molding, another typical application for a bedroom. 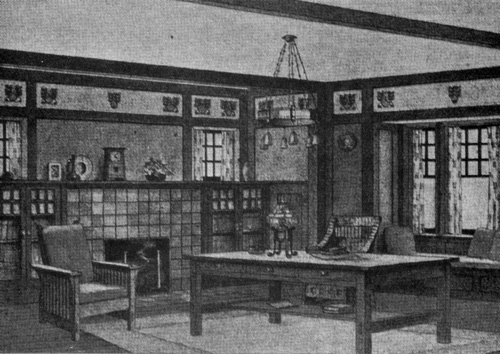 Black and White Renderings: from the Craftsman magazine show typical spot stencil applications, where only a portion of design is used instead of a border.